It was once the future of GM. Now it's in the past. According to the Associated Press, the last Chevrolet Volt rolled off the production line at the Detroit-Hamtramck assembly plant in Michigan, home to the hybrid-plug since 2010. First revealed as a concept at the 2007 Detroit Auto Show, the Volt was unlike anything GM has ever built before but has since become commonplace: an electric car with a gasoline engine backup. Range anxiety was a non-issue. 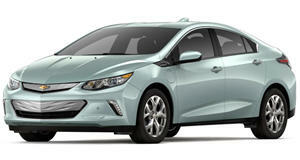 The Volt was the ideal vehicle to help symbolize a new GM, an automaker long associated with gas guzzlers. GM was also in the midst of recovering both financially and its public image in the wake of its 2009 bankruptcy and its US government bailout, a move that still remains controversial for many. The first generation Volt could go 38 miles on electricity before having its battery recharged, or if that was not an option the small gasoline engine would kick in as a generator. The system was brilliant and GM had high expectations. Unfortunately, sales averaged only around 20,000 units a year despite solid reviews, a redesigned and improved second generation model, and a loyal following. Ironically, one of the reasons for the Volt’s demise was its initial battle cry: gas prices. Back in 2010, prices surged and automakers naturally assumed trucks and SUVs would soon be in the past for a majority of buyers. Ford even dropped its beloved Ranger mid-size pickup truck, which has since returned, in favor of small cars like the Fiesta, which is also being phased out. And now GM is doing what Ford and many other automakers are doing: betting big again on trucks and SUVs thanks to cheap gas prices once again. It’s hard not to describe this as ironic. GM, however, isn’t giving up on electrification. Quite the opposite. Its all-electric Bolt lives on and an all-new electric platform will launch in 2021 underpinning the first of dozens of new EVs. In other words, GM is betting on two opposite ends of the automotive spectrum: EVs and trucks. As for the Volt, well, it did serve its purpose, such as advances in lithium-ion batteries.